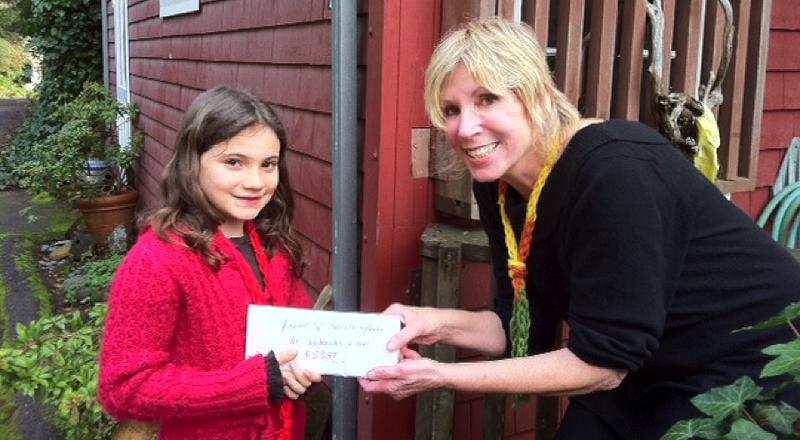 Join Annabelle, age 8 and donate to AHO. At only 8 years of age, Annabelle wanted to help youth less fortunate. She had an idea, and brought together her friends and made knitted necklaces. Then she set up a booth in front of her house and sold these necklaces as a fundraiser for AHO. Here she is presenting the donations she raised to Zara. If you would like to help AHO in its mission, please consider making a donation today. You can call us at 415/381-7173 or donate online securely using PayPal ‘Make a Donation’ button below. If you would like to donate to a specific program or a specific purpose (e.g. holiday/birthday gift certificates), please include this information in the Notes section on PayPal ‘Make a Donation’ button below. Your message will be sent directly to Ambassadors of Hope and Opportunity. Click below to make a one-time donation of $25, $50, $100, $250 or you can specify the amount. You can also make a monthly donation with your Credit Card or PayPal account. You will be billed monthly and you are free to cancel at any time. Ambassadors of Hope and Opportunity relies on the generous donations of people like you to operate our programs. Your donation to AHO can open the door to a future of hope and opportunity for a heathy and fulfilling future for all youth.